The month of October is the month we think about Stewardship. But in the Universal Church, it is also the month of the Holy Rosary. Catholics are encouraged to pray the rosary, particularly together as a family. Thanks to Relevant Radio, our Catholic Radio Station for San Diego, the people of God are invited to pray together when they drive or jog or take long walks. 5 pm Monday through Friday is Relevant Radio’s Family Rosary across America. You can download rosary prayers from their website, or just click on this link for the Joyful Mysteries, appropriate to our Joy of Generosity Stewardship Theme. 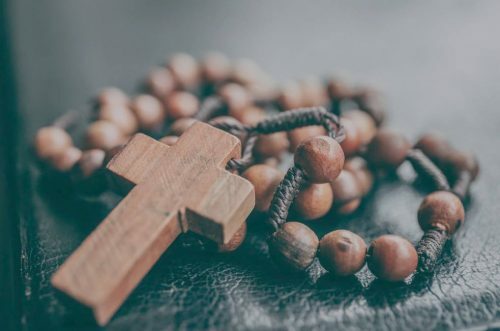 When we pray the rosary, we are praying the Bible. The text of the prayers come from Jesus’ prayer, (the Our Father) and the Hail Mary came from the salutation of the angel when he greeted our Blessed Mother. When we pray the rosary, we ask Mary to intercede for us with her son, Jesus.